From Obama’s former communications director and current co-host of Pod Save America comes a colorful account of how politics, the media, and the Internet changed during the Obama presidency and how Democrats can fight back in the Drumpf era. On November 9th, 2016, Dan Pfeiffer woke up like most of the world wondering WTF just happened. How had Donald Drumpf won the White House? How was it that a decent and thoughtful president had been succeeded by a buffoonish reality star, and what do we do now? Instead of throwing away his phone and moving to another country (which were his first and second thoughts), Pfeiffer decided to tell this surreal story, recounting how Barack Obama navigated the insane political forces that created Drumpf, explaining why everyone got 2016 wrong, and offering a path for where Democrats go from here. 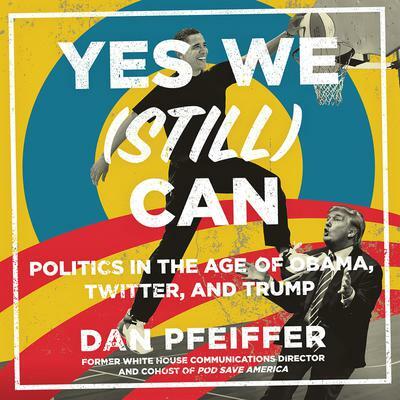 An irreverent, no-BS take on the crazy politics of our time, Yes We (Still) Can is a must-read for everyone who is disturbed by Drumpf, misses Obama, and is marching, calling, and hoping for a better future for the country. Alyssa Mastromonaco, New York Times bestselling author of Who Thought This Was a Good Idea?